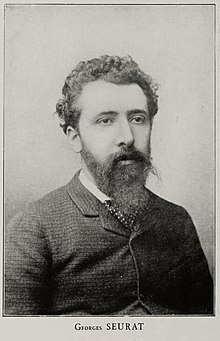 Georges-Pierre Seurat (2 December 1859 – 29 March 1891) was a French Post-Impressionist painter and draftsman. He is noted for the color-technique of pointillism. His large-scale work A Sunday Afternoon on the Island of La Grande Jatte (1884–1886) broke with Impressionism and initiated Neo-impressionism. Seurat, 1884: 'Study for La Grande Jatte' 1884, oil on canvas; current location: National Gallery of Art, Washington D.C.
Seurat, c. 1884-86: 'A Sunday Afternoon on the Island of La Grande Jatte', oil-painting on canvas; current location: Art Institute of Chicago, U.S.
Seurat, 1890: 'Moored Boats and Trees', oil-painting on wood, oil on panel; current location: Philadelphia Museum of Art, U.S.
..the flag is green with a red spot in the center; above, the blue of the sky, the orange-tinted white of the walls, and the orange-grey of the clouds. On Pissarro's advice I'm abandoning the emerald green.. I have told him nothing [an art-journalist in Paris who wrote in 1887: 'Seurat sees his paternity of the theory Neo-Impressionism contested by misinformed critics and unscrupulous comrades'], but what I have always thought: the more of us [the Neo-Impressionists] there are, the less originality we will have, and the day when everyone this technique, it will no longer have any value and people will look for something new as is already happening.. .It is my right to think this and to say it, since I paint in this way [ Neo-Impressionistic ], only to find a new approach which is my own. Allow me to point out an inaccuracy in your biography of Signac, or rather, in order to set aside all doubt, allow me to specify..
Knowing Corot's ideas on tone [copy of a private letter, October 28, 1875].. and Couture's precepts on the subtlety of tints (at the time of his exhibition), having been struck by the intuition of Monet and Pissarro.. .Rood having been brought to my attention in an article by w:Philippe Gille, Figaro 1881, 3. 1885, studies at the 'Grande Jatte' and at Grandcamp; I took up again the 'Grande Jatte' composition October 1886. 4 October 85 I make Pissarro's acquaintance at Durand-Ruel's. 1886, January or February, a small canvas by Pissarro, divided and pure color, at Clozet's, the dealer on the Rue de Chateaudun. Signac, definitively won over and who had just modified the paintings 'The Milliner',  and 'Appreteuse et garnisseuse Modes' [exhibited in May 1886], Rue de Caire, p. 174J, following my technique at the same time as I was finishing the 'Jatte'.. .You'll agree that there's a nuance here and that if I was unknown in 85 [ Félix Fénéon did not mention Seurat in his article as leader / initiator of Neo-Impressionism|Neo-Impressionism I nonetheless existed, I and my vision that you have described in an impersonal fashion so superbly, aside from one or two insignificant details. I knew van Gogh less intimately. I spoke to him for the first time in 1887 in a popular eatery near 'La Fourche', Avenue de Clichy, [Paris], (closed). A huge windowed room was decorated with his canvases. He exhibited at the 'Independants', [Paris] in 1888, 1889, 1890..
Signac told me of his death this way: 'He [= Vincent van Gogh ] gave himself a bullet in the ribs; it passed through his body and lodged in his groin. He walked for two kilometers, losing all his blood, and went on to die in his inn'. 'A Sunday on the Grande Jatte'. 1884, 3 meters / 2 meters. ..studies at 'the Grande Jatte' and at Honfleur at Grandchamp, Independants in 1887.. In conclusion I am going to give you the aesthetic and technical note that concludes Mr. Christophe's piece and which originated with me; I am modifying it a little, not having been well understood by the printer. Harmony is the analogy of opposites, the analogy of similarities of tone, of tint, of line taking account of a dominant and under the influence of the lighting, in combinations that are gay calm or sad. for tone, a more luminous/lighter one for a darker one. for tint, the complementaries, that is, a certain red opposed to its complementary, etc. for line, those making a right angle. Calmness of tone is the equality of dark and light; of tint, of warm and cool, and the horizontal for line. Sadness of tone is the dark dominant; of tint, the cool dominant, and of line, downward directions. The means of expression is the optical mixture of tones, of tints (of local color and the illuminating color: sun, oil lamp, gas, etc. ), that is, of the lights and of their reactions (shadows) following the laws of contrast, of gradation, of irradiation. The frame [is no longer as in the beginning version] is in a harmony opposed to those of the tones, tints, and lines of the [motif of the] picture. They [the visitors in his studio, praising his work] see poetry in what I have done. No, I apply my method and that is all there is to it. I painted like that because I wanted to get through to something new - a kind of painting that was my own. The art of painting is the Art of hollowing out a canvas. Among these independent artists there is one, Monsieur Seurat, who must be singled out. At the time of the Salon of 1882 I praised an excellent portrait of his, done in charcoal, which I was happy to see again. It is accompanied by a series of sketches and a landscape of striking aerial transparency, over which the lively light of a hot summer sun plays freely; all this is done in a sincere and candid style and reveals a depth of conviction which one regrets not to find among certain converts to Impressionism. In December 1884 the new 'Society of Independent Artists' organized its first exhibition in the "Pavilion de la Ville de Paris," on the Champs-Elysees in Paris. Seurat was one of the exhibiting artists. Yesterday I had a violent run-in with Monsieur Eugene Manet [brother of Édouard Manet and married with Berthe Morisot ] on the subject of Seurat and Paul Signac.. .I beg you to believe me when I say that I rated Manet roundly.. .. I explained to Monsieur Manet, who probably didn't understand anything I said, that Seurat had something new to contribute.. ..that I was personally convinced of the progressiveness of his art, which would yield, at a given moment, extraordinary results.. .We shall see. Monsieur Manet would also have liked to prevent Seurat from showing his figure painting. I protested against this, telling Manet that in that case we would make no concessions, that we were ready, if space were lacking, to limit our paintings ourselves [at the coming eight Impressionist exhibition in Paris], but that we [the Neo-Impressionists] would fight against anyone who sought to impose his choice on us. Things will arrange themselves somehow, parbleu! Great as was my wonderment [visiting the 8th Impressionist Exhibition, May/June 1886, at 1, rue Laffitte in Paris] it was tenfold increased on discovering that only six of these pictures were painted by the new man, Seurat, whose name was unknown to me; the other five were painted by my old friend Pissarro.. .The pictures were hung low, so I went down on my knees and examined the dotting in the pictures signed Seurat, and the dotting in those that were signed, Pissarro. After a strict examination I was able to detect some differences, and I began to recognize the well-known touch even through this most wild and most wonderful transformation. Yes, owing to a long and intimate acquaintance with Pissarro and his work, I could distinguish between him and Seurat, but to the ordinary visitor their pictures were identical. A canicular sky, at four o'clock, summer, boats flowing by to the side, a group of chance Sunday visitors enjoying the fresh air among the trees; and these forty-odd persons [in the painting 'La Grande Jatte' are fixed in a hieratic and simplified composition, they are rigorously drawn, of some we see the backs, some we see full-face, some in profile, some are seated at right angles, some are stretched out horizontally, some are standing up straight. The atmosphere is transparent and singularly vibrant; the surface seems to fluctuate. Perhaps this sensation, which is also experienced in connection with other paintings in the same room, can be explained by the theory of Dove: the retina, expecting distinct rays of light to act on it, perceives in rapid alternation both the disassociated colored elements and their resultant color. The impressionist paintings of Manet, Cezanne and Monsieur Degas, express with exemplary sincerity the new sensations, the new world our eyes experience. Now here the successors to these artists [Seurat & Pissarro ] are trying to perfect the forms created by them. They found in the notes of Delacroix, in the scientific discoveries of Chevreul and Rood, the suggestion for a type of painting in which color impressions are ordered by the combining of little multi-colored brush strokes. But while they were attentive to such improvement of the means, they forgot the true end of art, the sincere and complete expression of vivid sensations. The works of these painters - Pissarro and Seurat are the most notorious - are interesting only as the exercises of highly mannered virtuosos. Their paintings are lifeless for the painters did not strive for sincerity, being too taken up with external formulas. Seurat sent two canvases to Martinet [Paris' art-dealer], the latter, after having gone into raptures at Seurat's studio, began to stammer when directly asked to exhibit the paintings: the gas light, the white frame, the painter's own interest, etc., etc. I went to see him [Martinet], and since he had asked me to give him something to sell, he gave the most threadbare excuses; passing by with Seurat that evening we saw the two canvases, they were shown not on the boulevard, but on the Rue de Helder. Again our secret enemies, the Boulards and their consorts have been up to their old tricks. - I will send him nothing..
[Seurat] wanted to make of painting a more logical art, more systematic, where less room would be left for accidental effect. Just as there are rules for techniques, he wanted them also for the conception, composition, and expression of subjects. Yesterday I went to Seurat's funeral. I saw Signac who was deeply moved by this great misfortune. I believe you are right, pointillism is finished, but I think it will have consequences which later on will be of the utmost importance for art. Seurat really added something. Not only did he [Seurat] never begin his paintings without knowing where he was going, but his concern went even beyond their success as individual works. They had no great meaning for him if they did not prove some rule, some truth of art, or some conquest of the unknown. As in summer the grass grew high on the bank [in the Seine] and prevented Seurat from seeing the boat which he had put in the very forefront - and he complained of this mischance - I helped him by cutting the grass; for I was almost certain that he was going to sacrifice the boat. Although he was not the slave of nature, he was respectful of it, for he was not imaginative. His concern centered most of all on tints, tones and their interactions. Coming from Paris, turning to the right, close to the spot where they go bathing on Sundays, on the great arm of the river that goes by Courbevoie and Asnieres, one often saw Seurat painting. He told me sadly that the boys who played or bathed in the neighborhood, when they saw his picture, picked up stones.. Confronting his subject, Seurat, before touching his little panel with paint, scrutinizes, compares, looks with half shut eyes at the play of light and shadow, observes contrasts, isolates reflections, plays for a long time with the cover of the box which serves as his palette; then, fighting against matter as against nature, he slices from his little heap of colors arranged in the order of the spectrum the various colored elements which form the tint destined best to convey the mystery he has glimpsed. Execution follows on observation, stroke by stroke the panel is covered.. I had been in Paris for three years, I had been to all the museums, to Durand-Ruel's gallery and to all the last exhibitions of the old guard impressionists, when Seurat's art was revealed to me [in Paris, 1884] by [his large painting] 'The Bathers (Une Baignade) (Asnieres)', which I saw in the canteen of the Salon des Artistes Independants. Although I did not commit myself in writing, I then completely realized the importance of this painting; the masterpieces which were the logical consequences of it followed without bringing me again the spice of surprise. I think it was at the famous 'Eight Exhibition of Paintings' in the rue Laffitte [in Paris] that I first saw and became acquainted with Seurat and the painters he influenced. Fénéon wrote the author [John Rewald]; as quoted by John Rewald, in Georges Seurat', a monograph; Wittenborn and Compagny, New York, 1943, p. 76 – note 53. Seurat... had been for several years... a pupil of Ingres' disciple Lehmann, who had infused him with a pious devotion to his master. Yet... Seurat had also carefully analyzed the paintings of Delacroix, had read with avidity the... Goncourt brothers and had studied scientific treatises on color harmonies by Chevreul... This had led him to conceive the idea of reconciling art and science, an idea inseparable from the general trend of the time to replace intuition by knowledge and... research... Seurat limited his palette to Chevreul's circle of four fundamental colors and their intermediate tones: blue, blue-violet, violet, violet-red, red, red-orange, orange, orange-yellow, yellow, yellow-green, green, green-blue and blue again. These he mixed with white, but to assure... luminosity, color and harmony, he did not mix the colors among themselves. Instead, he chose to employ tiny dots of pure color, set next to each other, and to permit the mixture to be accomplished optically... in the eye of the onlooker, placed at a proper distance. This method he called divisionism. John Rewald, History of Impressionism (1946) pp. 381-382. While the small oil sketches Seurat painted out-of-doors in preparation for his compositions often show an impressionist technique, his large canvasses were done in the studio. ...[H]e avoided the sensuous charms which had fascinated the impressionists and sacrificed instantaneous sensations to an almost rigid stylization. John Rewald, History of Impressionism (1946) p. 383. Standing on his ladder, he patiently covered his canvas with those tiny multicolored strokes, which give it, from a distance, that intense life and luminosity which are the secrets of his style. At his task, Seurat always concentrated on a single section of the canvas, having previously determined each stroke and color to be applied. Thus he was able to paint steadily without having to step back from the canvas in order to judge the effect obtained.. .Nothing was left to change, to some happily inspired brush stroke. John Rewald, Post-Impressionism, From Van Gogh to Gauguin, John Rewald, Museum of Modern Art, New York, 1956, p. 93. The Impressionists had discovered the advantages of optical mixture – allowing the eye to mix adjacent colors [directly on the canvas] rather than mixing them on the palette.. .Seurat would determine the placement of adjacent colors, placed on the canvas in the form of small dots, according to principles of the optical perception of color, developed by [Ogden] Rood in laboratory experiments. [Seurat had made] the great innovation of that day. This new technique Neo-Impressionism made a great impression on me. Painting had at last been reduced to a scientific formula; it was the secession from the empiricism of the preceding areas. At the age of just twenty-five Seurat set out to produce a masterpiece A Sunday Afternoon on the Island of La Grande Jatte, his famous and large [3 x 2 meter]] painting, Seurat made in 1885-86 – a painting more than sixty square feet in size – a definitive illustration of the systematic use of scientific color theory [Color-divisionism] in painting. As a student Seurat had begun to read scientific treatises on the visual perception of color, and had become fascinated with the proposition he read in a textbook by Charles Blanc, an art critic, that 'color, which is controlled by fixed laws, can be taught like music'.. .Seurat studied research on color theory that had begun with the discovery by Michel Eugène Chevreul, a chemist at the tapestry workshops of 'Les Gobelins', that the perceived intensity of a color did not depend so much on the pigmentation of the material used as it did on the color of the neighboring fabric – a finding that had subsequently been developed by others, including an American physicist, Ogden Rood, who published a treatise on chromatics in 1879. Seurat read Delacroix's journals and made notes on his use of colour mixing in his paintings. Delacroix's puzzlement over why blobs of blue and yellow failed to produce green could have prepared Seurat to see in his French translation of Rood's Modern Chromatics an answer to the problem. He [Seurat] mentions in his letter to Fénéon that Ogden Rood's book had been brought to his attention in 1881 (the year it was published in France).. .w:Ogden Rood's chief lesson was to make clear the distinction between coloured lights and coloured pigments.. .However, as [w:Herbert, Robert L.|Herbert]] points out, in 1881 and 1882 Seurat's oil paintings were still in the Barbizon tradition and it was not until 1883 that his palette lightened and not until he started 'Grande Jatte|A Sunday Afternoon on the Island of La Grande Jatte|Grande Jatte' in 1884 that he started to use separate blobs of complementary colour in a clear, conscious manner..
Seurat's letter to Fénéon was written on 20 June 1890, six years after he had started to use the pointillist technique and it seems that it was written to establish his primacy in all areas concerned with pointillism. It is perhaps hard to understand today but when Fénéon wrote the first serious review of the works of the Neo-Impressionists after the 8th Impressionists Exhibition of 1886 he mentions: 'Messieurs Georges Seurat, Camille and Lucien Pissarro, Dubois-Pillet, and Paul Signac divide the tone in a conscious and scientific manner'. By 1890 other artists had joined the bandwagon and I believe Seurat must have felt that he was in danger of being undervalued or overlooked as the true originator of the movement. At the Salon des Indépendants in 1888 Seurat demonstrated the versatility of his technique by exhibiting 'Circus Sideshow', a nighttime outdoor scene in artificial light, and Models, an indoor scene by daylight (Barnes Foundation, Philadelphia). This is Seurat's first nocturnal painting and also his first depiction of popular entertainment. It represents the parade or sideshow of the Circus Corvi, which had set up near the Place de la Nation in Paris in the Spring of 1887. Sideshows were held on the street, for free, to entice passersby to purchase tickets. The onlookers at the far right are queued on stairs leading to the box office. But as this exhibition emphasizes Seurat first formulated his ideas about color and atmosphere on paper, in drawing, working in black and white. Applying his beloved black conté crayon to the specially textured Michallet paper that he almost always used, he created an impressive tonal range of velvety blacks, gossamer veils, crazy all-over scribbles, porous grids, methodical cross hatchings and uncrossed hatchings.